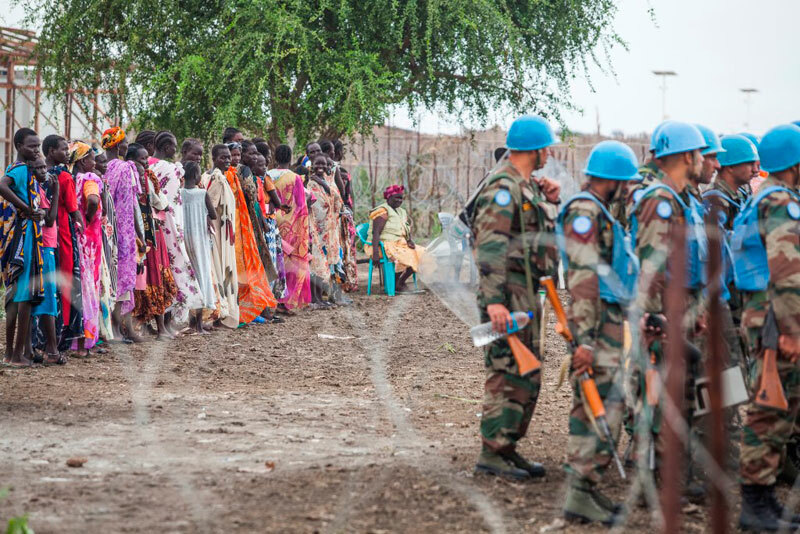 South Sudan – In December of 2013, violent clashes erupted across South Sudan, displacing nearly 2.4 million people. Fearing for their lives, thousands of civilians sought refuge at UN bases throughout the country. The protection of civilian (PoC) areas within the bases were not adequate to accommodate the tens of thousands of internally displaced persons (IDPs) that arrived, and the UN and humanitarian actors struggled to provide protection, food, shelter, medical and other assistance required at these sites. As many as 200,000 IDPs continue to seek shelter in these UN PoC sites as they flee the vicious civil war. Today, an independent report, “If We Leave We Are Killed: Lessons Learned from South Sudan Protection of Civilian Sites 2013–2016,” was launched in Juba to take stock of the PoC response to date and offer guidance for future action. The report, authored by Michael J. Arensen, was commissioned by IOM and the Swiss Agency for Development and Cooperation. The launch event included a panel discussion with key stakeholders, including the author, representatives from the UN peacekeeping mission, humanitarian organizations and Special Rapporteur on the Human Rights of IDPs Dr. Chaloka Beyani. “The PoC sites in South Sudan are unprecedented and illustrate the best example of a UN Mission and humanitarian actors working together to save lives. Now, we must evaluate our response with the aim of improving it for the future,” said David Derthick, IOM South Sudan Chief of Mission. Conditions for IDPs within the PoC sites can be crowded and harsh, but the sites represent one of the only sources of safety for civilians as they continue to bear the brunt of the conflict. Despite cautious optimism as implementation of the peace agreement moves forward, key stakeholders recognise that PoC sites are likely to remain necessary in the years to come. Additional launch events are planned in Geneva (9 May), London (10 May), New York (12 May) and Washington, D.C. (14 May). Download the report at: https://publications.iom.int/system/files/pdf/if_we_leave_0.pdf.